He is a Republican, and has donated money to Johnny Isakson and George W Bush. In 2012, Love captained the U.S. Team that lost the 2012 Ryder Cup. In 2016, Love captained the winning U.S. Team at the 2016 Ryder Cup. After Davis failed to qualify for the 2017 U.S. Open, he caddied for Dru, who made his professional debut. On December 16, 2018, Love and his son Dru won the Father/Son Challenge at Ritz-Carlton Golf Club in Orlando, Florida. Has a portion of Interstate 95 named after him. In 1998, the segment of I-95 which extends in Georgia from the McIntosh County line to Highway 341 at exit 7A and B was designated the "Davis Love III Highway." Love hit the second-longest drive ever officially recorded in competition play at the Mercedes Championships in 2004. His 476-yard (435 m) drive was still 39 yards (36 m) short of Mike Austin's record. He also has a restaurant named after him in his hometown of Sea Island, Georgia, called the Davis Love Grill. ^ "Official World Golf Ranking, "July 19 1998"" (PDF). OWGR. Retrieved June 20, 2012. ^ "69 Players Who Have Reached The Top-10 In World Ranking" (PDF). OWGR. Retrieved June 20, 2012. ^ Auclair, T.J. "PGA picks Love III to lead Team USA". PGA of America. Archived from the original on March 14, 2012. Retrieved June 20, 2012. ^ Harig, Bob (February 24, 2015). "Davis Love III named Ryder captain". ESPN. ^ "Love III gets Hall of Fame call: Woosnam, Mallon, Ochoa, Longhurst also included in Class of 2017". PGA Tour. October 18, 2016. ^ "Crash claims four". Bryan Times. Ohio. UPI. November 14, 1988. p. 14. ^ Fields, Bill (November 3, 2008). "Lost In The Fog". Golf Digest. ^ "2011–12 Tarheel Men's Golf". p. 36. Retrieved June 20, 2012. ^ Auclair, T.J. (August 9, 2012). "A Quick Nine: Greatest PGA Championship moments". PGA of America. ^ Verdi, Bob (June 12, 2006). "Davis Love III makes the rainbow connection". ESPN. ^ Bonk, Thomas (June 12, 2006). "He's Set for a Major Return". Los Angeles Times. ^ "Love Golf Design". Retrieved June 20, 2012. ^ "Golf Magazine's Top 100 Courses in the World". Golf.com. Retrieved April 18, 2014. ^ "United States Golf Association's International Book Award 1987–-2002". Archived from the original on 2012-10-28. ^ "The Davis Love III File". PGA of America. Archived from the original on March 27, 2012. Retrieved June 20, 2012. ^ McCreary, Joedy. "Wyndham: Love Wins, Tiger's season ends". PGA. Associated Press. Retrieved August 23, 2015. ^ Strege, John (December 16, 2018). "Davis Love III and son Dru shoot 56 to win PNC Father Son Challenge by three". Golf Digest. Retrieved December 17, 2018. 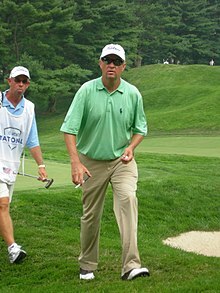 Wikimedia Commons has media related to Davis Love III.